2011 has turned out to be a fantastic year so far for me. My novel Soul of a Warrior was picked up by Crescent Moon Press this summer. What a journey that turned out to be from start to finish. I’ve barely floated down out of the clouds after learning my baby would soon be published. But everything takes time and I’m probably not going to be able to hold a copy of my book in hand until sometime in the next year. Soooo, what’s a writer to do while she waits for that all-important day? Well, the easy answer would be to write another novel. my life until after I learned how to express myself through writing. So it should be easy enough to put my distractions aside for a couple hours a day and spend it with characters I love on exciting worlds of my own creation. Should be, but isn’t. So maybe I need to try a little something new, get out of my comfort zone for a month. up. 50,000 words in one month, exactly what I need to finish Ghost Warrior. Since I have several author friends also gearing up to spend a solid month of writing with no distractions, we can cheer each other on when the words start to slow, catch hold of that muse before she/he decides to run and hide. I’m feeling excited again, almost as much as I was when Soul of a Warrior got picked up. Keep checking in during the month of November and I’ll let you know how it’s going. Can’t wait to see what happens when I add a little pressure to the mix. Posted by Denna Holm on October 25, 2011 in Archives. You did NaNo this year? How did it go? I would have known sooner, except I was doing it myself, so I didn’t have much time to browse any blogs. Wow, I’m really late answering this. That’s what I get for being away from my computer. 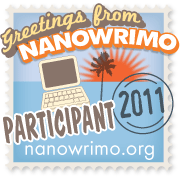 I did do NaNo this year and I had a blast. I was a little worried toward the end, but I squeaked in at 50,000 words. Gave me a good jump into the sequel to Soul of a Warrior.